In line with the players’ choice, Pominville is an easy choice on a team that did underachieve for portions of the season. I was happy to see him hit the 30-goal plateau, it was a well deserved accomplishment. Pominville embraced his captaincy this season and had a great year. I think consistent line mates could yield similar results in 2012-13. Boyes suffered through a miserable 82-game season with little to show for it. Sure he was stuck on the fourth line and had little chance to produce, but at $4M you can’t afford to be not scoring goals. I was happy to see him come to Buffalo, things just didn’t work out for him this year. This was a tough one for me to pick. Foligno was right up there with Brayden McNabb, David Leggio and Joel Armia for the organizational award. 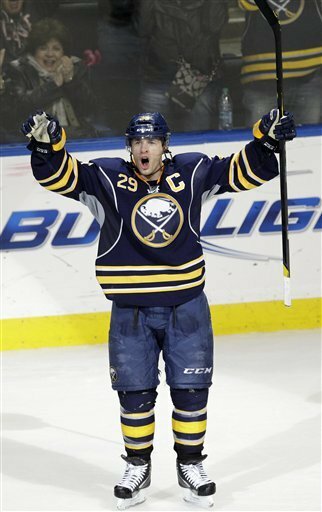 However, Foligno’s arrival was such a shot in the arm for the Sabres that it was too difficult to ignore. It is actually pretty easy to sum up Ryan Miller’s season. Elite hockey, then garbage hockey and then more elite hockey. Sounds like a pretty decent sandwich, no? October was kind to the netminder before suffering a rough start against Philly on national television. He followed that game with a five-goal win against the Jets. His GAA didn’t get any help when he was knocked from his next start in Boston by Milan Lucic. He didn’t start again until December and struggled to find his game for the entire month. He then locked down beginning on January 1 and didn’t look back, putting together a 2.27 GAA and .924 SV%. He didn’t start rolling at a regular clip until after he had missed 34 games with injury. He only played 48 games but picked up 34 points (15+19) in that span. He was indeed a consistent weapon the Sabres could rely on down the stretch, making him extremely valuable heading into next season. In case you were wondering, Ehrhoff only makes $4M per year, technically. Considering that cap hit, he was really freaking valuable for most of the season. He was easily the most consistent defenseman the Sabres had and they missed him desperately when he was hurt. Too many people ignored his performance because he wasn’t scoring goals and because he makes $10M per season. He caught a lot of flak for not putting up monster numbers offensively, but he was still extremely valuable. Easy choice considering he is the team MVP, see above for the reasoning. 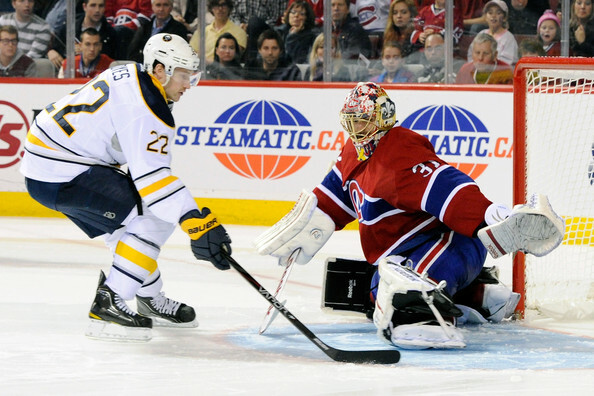 Even though he has moved on, Gaustad was a valuable piece of Sabres’ defensive puzzle. His penalty killing was phenomenal and he brought the Sabres a big return because of that. Maybe he will take a pay cut to come back next season. That nasty forehand deke he had was money for the longest time this season, one of his few contributions along the way. Honorable mention goes to Thomas Vanek and his slap shot. He had a pretty ugly season and his cap hit makes things that much worse. I’m sure he would like to hit rewind and put forth a better showing this year. This award goes to the best all-around defenseman on the roster. It is motivated by defensive zone play more than anything. 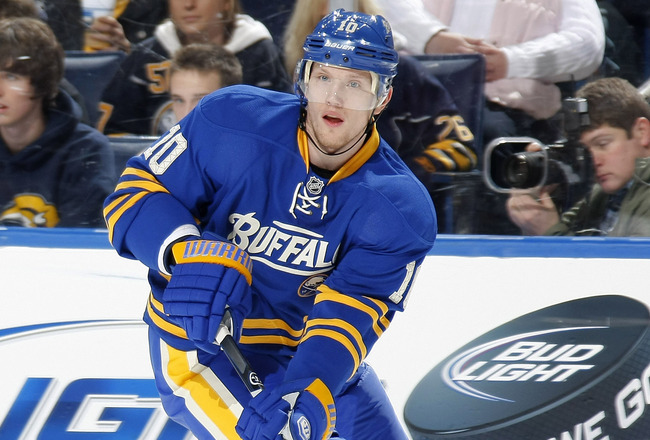 Ehrhoff gets the nod because of his consistency throughout the season. For further details, see above. Leopold led all Sabres defensemen in goal scoring. 10 goals from a defenseman isn’t a bad number and Leopold even offered some solid defending to go along with it – much to the chagrin of this award’s namesake. I’m a big fan of Leopold’s game, that is two-straight productive seasons for him. Need I say more? Perhaps the best contribution made by Gragnani was being traded for Alex Sulzer. Thank god the management decided to put the proper logos on the bottom of the videoboard. Although, it did mean abandoning the super awesome sabres that were placed behind the slug logo. Also, I really REALLY like Lonely Boy as the new goal song. I hate that the IIHF uses these bells and I hate that the Sabres use them. Can we just do away with them? Please? A tough award for me to handout. There are so many great Twitter accounts administered by Sabres fans. However, when Kevin Snow is running the show the Sabres account has accurate game info and tosses out some pretty good humor as well. I guess in Kevin’s case it is actually humour. John wins for two reasons. First, he would always toss my comments and questions on TBN’s On the Beat chat. Second, he always rolls out solid coverage on a daily basis (unless he is at Raw or a Foo Fighters concert).